Other Kebabs include Dana Meyer (drums),Mark Saxby,(guitar),Mike Dearing (guitar),Bill Clift Guitar/vocals,Martin Brown Keys,Brian Foley -Sax,John Oneill Sax,Tim Absolon Sax. Signed Squad members who have not yet played are Jim Kimberly – drums and Louis ( son of ) Tilbrook on drums. 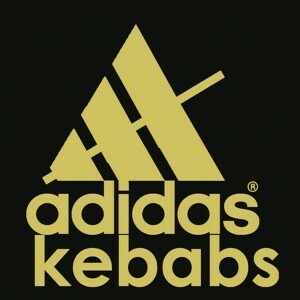 The core beliefs of the Adidas Kebabs are to be found in these 3 films. We formed the Adidas Kebabs as an excuse to escape our wives/partners/children/pets/curfews using the thin veneer of a gig as "work". Our set includes a mixture of trashed out funk /rocksteady / fucked soul and basically anything that requires no rehearsals whatsoever,enabling any tune to run between 2 mins and 2 days depending on the response of the audience . The gigs,which tend to occur every 6-8 weeks (depending on the cycles of the moon) are a small ,yet significant ,part of an ancient pre roman drinking ritual that can last up to 3 days. The track was recorded in the living room of my 3rd floor council flat,next to the river Thames, on the Saturday between Good Friday – the drinking day when Jesus was nailed to da cross,and Easter Sunday – the day when he woke up with da hangover and the holes in dem hands and dem feet. We started recording about midday using the Carling/Grolsch/Marijuana combination and upped the ante to Red Stripe/Chemicals for the evening listen resulting in a letter from Greenwich Council ,a week later,threatening to take action by confiscating my speakers. Ironically ,if the bands profile grew beyond the pubs,strip joints,take aways and crack dens of South London ,it would result in a lawsuit from Adidas. However the band would prefer sponsorship. © 2019 The Beatles Complete On Ukulele.